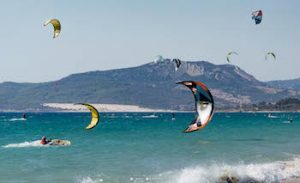 Want to learn to kitesurf in Tarifa? Our courses are all individually tailored to your ability and experience. So you wont be covering anything you’ve already learned and the learning will be based at your speed. This way we can assure you a personalised service that guarantees you learn as fast as possible. Courses have a maximum of 4 students with one qualified instructor in the GROUP format. If you would prefear your own progression with a complete gear just for your self we recommend the SEMI-PRIVATE format with a qualified instructor only for 2 students. For everyone who wants to learn the basics from total beginner to practicing your first rides..
For all those who have previously done a course and want to pick up from where they left on and continue their development. At this level we will assist you to decide how many days you need based on your level and how long you have. CK+ (extra days), extra days after CK3 are charged at 60€. 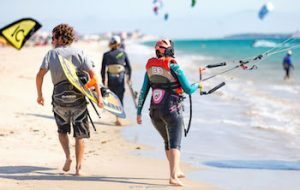 For all those who have started to ride but still want the confidence and security of having an instructor on the beach to keep an eye on them while they become an independent kitesurfer. 10% for groups or families of 4 people or more. 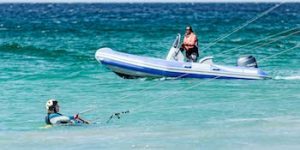 Full Equipment Hire (kite & bar, board, wetsuit, harness, buoyancy aid, helmet). Beach transfers if you don’t have your own car. 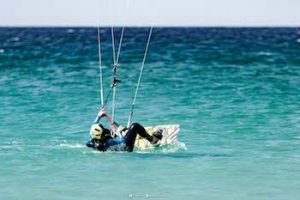 If you require a more personalised service or want to learn in a shorter time we also offer semi private and private lessons.